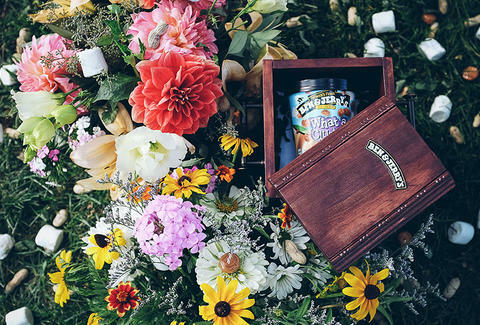 Dearly beloved: we are gathered today to pay our final respects to a glut of Ben & Jerry's flavors that -- for whatever reason -- were killed off, retired, or just plain didn't work out at all. And the Vermont-y ice cream maestros wanted to make sure these flavors were gone but not forgotten, so they dedicated a plot of land in their Waterbury, VT HQ to commemorate these fallen soldiers with actual pun-tastic headstones. It's probably the most cheerful you'll ever be at a graveyard (unless you are a necrophiliac). Here are some of the highlights of the dearly de-pinted. Sugar Plum, though whimsical and fancy free, ended up not connecting with customers in the way that the company had hoped. According to Sean Greenwood, "Grand Poobah of PR" for Ben & Jerry's, it might be one of the reasons it's steered clear of grape-flavored ice creams altogether. Not every flavor in the graveyard was a bomb from the get-go. White Russian -- coffee ice cream with Kahlua -- enjoyed decade-long runs before being axed. This cocktail-inspired flavor held its own from 1986 until 1996, when it was cut off and sent home in a taxi. In 1998, The Big Lebowski was released. If only White Russian had lived to see that day, the Dude just might have prolonged the magic. "Did these people really die?" Some flavors were never even meant for an extended run, and the SNL-inspired Schweddy Balls is a prime example. You've got vanilla ice cream, a hint of rum, and, of course, mounds of malted Schweddy Balls. The only thing missing is Alec Baldwin's gravely, seductive timbre. Which obviously is hard to capture in ice cream. Tragically, sometimes the best-laid plans of mice and men (or Ben & Jerry's) just fall apart. Peanut Butter and Jelly (peanut butter ice cream with peanut butter bits and strawberry jelly swirl) should be a no-brainer -- but its run only lasted a year. Why? I'm not sure, but maybe people prefer their sandwiches to stay in sandwich form. This is probably why B&J has never made a chicken Parm flavor. That rabbit's dynamite! This flavor -- coffee liqueur ice cream with a chocolate cookie crumb swirl and fudge cows -- was apparently not. Pears are nature's candy, so this very, very short-lived pint with fresh pear ice cream, notes of almond, and a big ol' fudge swirl maybe should have had a better reception. But then again, it was the most bizarre pear on ice since Moira Kelly and D.B. Sweeney tangled in The Cutting Edge. People probably just weren't ready for it. Dedicated to the stock market crash of 1987, Economic Crunch (a basic blend of vanilla, chocolate-covered almonds, pecans, and peanuts) didn't make it out of the calendar year. It's definitely one of the better-named flavors of all time, but maybe people didn't want to associate their financial ruin with nuts. Maybe this is why there wasn't a Recession Rum Raisin in 2007. This is one that may surprise people, as the dino-centric flavor was a childhood favorite for so many. With sweet cream ice cream, chunks of dinosaur fudge, and big ol' slabs of chocolate cookies, this is pretty much an 8-year-old's dream dinner. But to paraphrase the great dinosaur-hater Jeff Goldblum, "Life... uh... didn't find a way this time." Modeled after the quintessential French dessert, this flavor may have been a little high-concept for American ice cream guzzlers, but it did enjoy a very solid four-year run. It consisted of sweet custard ice cream, cut with a deep caramel swirl. If B&J's ever wants to please the Francophile palate again, I suggest Brie-flavored ice cream with baguette chunks. Honestly not even sure how this got through R&D. But could Ben & Jerry's be planning a Patti LaBelle-themed comeback for the flavor? Only time will tell. Wil Fulton is a staff writer for Thrillist. Follow him @wilfulton. Or don't. It's whatever.